﻿ When asked what quilt topics she’d like to learn more about, Sharon Goodman is quick to say machine quilting, foundation paper piecing, how to make a small quilt, how to work with fusibles, as well as new ways to use Cheryl Sleboda’s conductive thread to light up her quilts. Then she takes a breath. She knows she has a lot to catch up with. 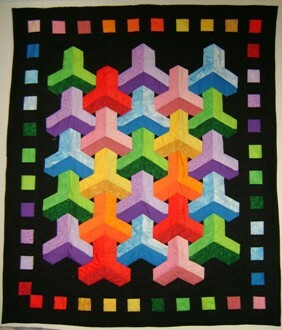 And after all, quilting is in her blood – her grandmother, her aunts, and her mother were all quilters. A quilt made by her grandmother, a red and white brickwork with green vines, was documented in the 1980s by the Quilt Project of the Illinois State Museum. But Sharon wasn’t interested until she took that class with CJ Spensley. From that fairly recent beginning, Sharon has already had a quilt accepted into shows at Gatlinburg, Tennessee and Grand Rapids, Michigan, including Moonrise Chicago, a stunning quilt of her own design. “Perhaps,” she says, “I may do San Francisco, too.” Although she is intrigued by modern quilts and loves traditional quilts, it is color palettes and fabric pattern textures that most excite her and prompt new design ideas. Sharon joined the guild in 2009 at the urging of her friend Judy Morgan and is a member of the Sew and Tell Bee.